Iliotibial Band Syndrome (ITBS) typically presents with knee pain on the lateral or outside edge of your knee at the lateral epicondyle of the femur. It occurs when the iliotibial band, the tendon that runs down the outside of the thigh from the hip to the knee, becomes tight or inflamed. When the IT band becomes stretched and tight, friction along the quad or hamstring muscles. IT band pain can be severe enough to completely sideline a runner for weeks or longer. ITB syndrome typically is worst while running downhill and may even be absent while running uphill. It can even be painful enough to drastically limit or even completely stop training. 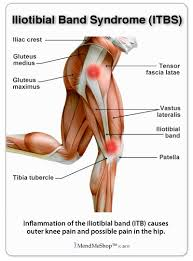 Iliotibial band syndrome (ITBS) is one of the most common sources for knee pain. It is estimated that 60% of all runners are injured in an average year. About one-third of those injuries occur to the knee, producing a yearly incidence rate of one in five runners. Patella tendonitis is an injury that affects the tendon connecting your kneecap (patella) to your shinbone (tibia). 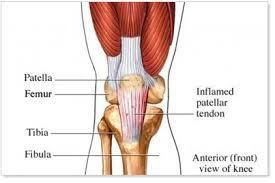 The patellar tendon plays a pivotal role in the way you use your quadriceps leg muscles. It helps your muscles extend your knee so that you can kick a ball, run uphill and jump in the air. Patellar tendinitis is most common in athletes whose sports involve frequent jumping — such as basketball and volleyball. For this reason, patellar tendinitis is commonly known as jumper’s knee. However, even people who don’t participate in jumping sports can experience patellar tendinitis. Movement of the knee may cause a crunching sensation called crepitus directly over the swollen tendon. A torn meniscus is a common knee injury. Any activity that causes you to forcefully twist or rotate your knee can lead to a torn meniscus. Each of your knees has two menisci — C shaped pieces of cartilage that act like a cushion in your knee. The meniscus is made of fibrocartilage which gives it a rubbery texture. The meniscus only has blood supply to its outer rim. Therefore, about 4/5 of a meniscus has no blood supply and therefore cannot heal a tear. 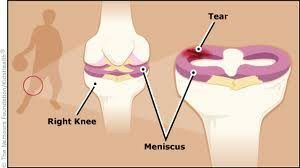 You might feel a “pop” when you tear a meniscus. Most people can still walk on their injured knee. Many athletes keep playing with a tear. Over 2 to 3 days, your knee will gradually become more stiff and swollen. Conservative treatment is sometimes enough to relieve the pain of a torn meniscus and give the injury time to heal on its own. In other cases, however, a torn meniscus requires surgical repair. There are four main ligaments in the knee that can be injured. Injury to a knee ligament may be described as stretched (sprained), or torn (ruptured). Ligament rupture can be partial (just some of the fibers are torn) or complete (the ligament is torn completely). Knee ligament injuries can cause pain, swelling, tenderness, bruising and reduced movement of your knee. Your knee joint may feel unstable and you may walk with a limp. Treatment of a knee ligament injury can depend on a number of things including which ligament is injured and severe. anterior cruciate ligament (ACL): ACL injuries are the most common cause of injury to the knee with 95,000 every year in the US. posterior cruciate ligament (PCL): major ligament in the knee connecting the thigh bone to the shin bone in the knee. Grade 1 Sprains: The ligament is mildly damaged. It has been slightly stretched, but is still able to help keep the knee joint stable. Grade 2 Sprains: A Grade 2 Sprain stretches the ligament to the point where it becomes loose. This is often referred to as a partial tear of the ligament. Grade 3 Sprains: Commonly referred to as a complete tear of the ligament. The ligament has been split into two pieces, and the knee joint is unstable. Osgood-Schlatter Disease is a common cause of knee pain in young children and adolescents who are still growing. This condition is characterized by pain and swelling below the knee joint on a prominence on the shin bone (tibia) called the tibial tuberosity. There may also be inflammation of the tendon/ligament that stretches over the knee cap and attaches to the top of the shin bone. 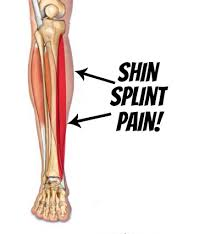 Shin splints is an inflammation of the muscles, tendons, and bone tissue around your tibia or shin bone. Pain typically occurs along the inner border of the tibia, where muscles attach the knee to the ankle. Medically known as medial tibial stress syndrome, shin splints often occur in athletes who have recently intensified or changed their training routines. The muscles, tendons and bone tissue become overworked by the increased activity. Shin splints typically develop after physical activity. They are often associated with running. Any vigorous sports activity can bring on shin splints, especially if you are just starting a fitness program. People who have flat feet or recurrent problems with shin splints may benefit from foot orthotics. Shoe inserts can help align and stabilize your foot and ankle, taking stress off of your lower leg.